Today's Dietitian evaluates the published analysis in JAMA alleging the sugar industry hid sugar's role in the development of heart disease. Sugar has been in the nutrition crosshairs for decades. An international debate over how much sugar is too much and whether or not it may be bad for health has ebbed and flowed over the years—the dust settling and then stirring up again. The latest volley, however, seems to be the loudest. An article published in JAMA Internal Medicine1 revealed documents from the 1960s and 1970s suggesting that the Sugar Research Foundation, now the Sugar Association (a trade group representing the sugar industry) worked together with Harvard University researchers (now deceased) and a public relations firm in a campaign to dispute sugar's suggested role in cardiovascular disease (CVD) and divert the focus to dietary fat. These are the allegations of the JAMA Internal Medicine analysis, published by researchers from the University of California, San Francisco (UCSF). But not everyone agrees. There are many on the other side of the sugar controversy who say that research funding from industry is essential to keep their research going, that findings from these studies are unbiased, and that the results of studies from decades ago have little to do with today's dietary recommendations, which are based on hundreds, if not thousands, of more current studies. 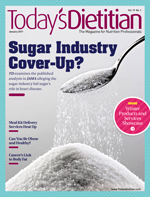 In this article, Today's Dietitian speaks with several experts to get their take on industry-funded research and the current sugar controversy. The article that spurred the current controversy was titled "Sugar Industry and Coronary Heart Disease Research: A Historical Analysis of Internal Industry Documents." Cristin Kearns, DDS, a postdoctoral fellow at the UCSF School of Medicine, Institute for Health Policy Studies, and lead researcher, said the following in the article: "Access to documents not meant for public consumption has provided the public health community unprecedented insight into industry motives, strategies, tactics, and data designed to protect companies from litigation and regulation." She further suggests the sugar industry's alleged manipulation of research and denial of a connection with heart disease was in line with that of the tobacco industry denying a connection to smoking and cancer. After gaining access to about 1,600 pages of documents, including correspondence between the Sugar Research Foundation and researchers, Kearns laid out what she says was a systematic manipulation of research findings on the connection between sugar and CHD. In a statement released by Walter Willett, MD, DrPH, chair of the department of nutrition at Harvard T.H. Chan School of Public Health, he says, "Overall, I would agree with their conclusion that there was not sufficient evidence to say that sugar was a causal factor in CHD risk." However, he adds, "Given the data that we have today, we have shown that refined carbohydrates and especially sugar-sweetened beverages are risk factors for cardiovascular disease, but the type of dietary fat is also very important." According to Neva Cochran, MS, RDN, LD, FAND, a nutrition communications consultant in Dallas, "The [Dietary Guidelines] limit was established not because there is anything inherently dangerous or unhealthy about higher sugar intakes, but because, for most calorie levels, eating more sugar than this will not allow for the consumption of a nutritionally adequate diet without exceeding calorie needs." Cochran points to data from the USDA showing that added sugar intake in the United States has been declining since its peak in 1999 (the largest decline occurring between 1999 and 2003). "The trend is in the right direction, and I don't believe further admonitions and restriction will have any greater effect," she says. However, the most recent National Health and Nutrition Examination Surveys data show that while added sugar intake has dropped over an extended period of time, the percentage of calories from added sugars didn't decline between 2003 and 2012. A 2015 study found that high sugar intake (50 g/day) of any kind (high fructose corn syrup, sucrose, or honey) for two weeks was associated with elevated triglyceride levels in individuals who had normal glucose tolerance or who had impaired glucose tolerance.6 Elevated triglycerides is a risk factor for heart disease. As a basis for comparison, one teaspoon of table sugar provides 4.2 g sugar, one teaspoon of high fructose corn syrup provides 5 g sugar, and one teaspoon of honey provides 6 g sugar. The average intake of added sugars in the United States is high—14% of calories (81 g) among children and 17% (77 g) among adults.7 If the 2015 study showing 50 g per day increases triglycerides can be duplicated, that would indicate that we're still consuming too much added sugars. Not surprisingly, there are some marked differences of opinion on whether findings from industry-funded research are biased. "We acknowledge that the Sugar Research Foundation should have exercised greater transparency in all of its research studies," says Courtney Gaine, PhD, RD, CEO of the Sugar Association, referring to the studies in the 1960s cited in the JAMA Internal Medicine article. Aside from the question of an alleged cover-up of sugar's link to heart disease, there's the bigger issue of whether industry-funded research in general tips the scales in favor of the food industry and prevents the complete nutrition story from surfacing, as some have suggested. Willett pointed out in his statement that things have changed over the years: "Conflict-of-interest standards throughout the academic world have changed dramatically since the 1960s." Cochran refers to a 2016 article in Nutrition Today, which states, "Focusing narrowly on the perceived or real impact of the source of funding is not very helpful in identifying overall strengths and weaknesses in nutrition research. "8 Cochran adds, "It is the norm in the pharmaceutical industry for companies to fund research on new drugs they develop. Likewise, industry needs to support food and nutrition research." Connie Diekman, MEd, RD, CSSD, LD, FADA, FAND, director of university nutrition at Washington University in St. Louis, says the authors of the JAMA Internal Medicine analysis concluded, "The evidence on which the [sugar] industry shaped the review's conclusions is circumstantial," referring to a review that played prominently in the study's analysis. "My opinion is that we're only just beginning to understand the influence of food industry funding in nutrition," Kearns says, standing by her original conclusions. When studies in her analysis were published more than 50 years ago, funding disclosures and transparency standards weren't what they are today. While the recent JAMA Internal Medicine article clearly indicates that funding influenced the sugar findings back in the 1960s, the answer to the question of whether industry funding affects research findings today isn't so clear. Willett said in his statement that "… industry funding is a concern in research, as it may bias what is published, and it is doubly a concern in reviews because this inevitably involves some judgment about the interpretation of data." Diekman adds, "Partnering with industry to conduct evidence-based research is a priority to our profession. If we do not work together to ensure that studies are well designed to achieve a science-based outcome, the potential is there for research to be slanted." "I wish I didn't have to take a penny from industry," says Paul Jacques, DSc, from the Jean Mayer USDA Human Nutrition Research Center on Aging and director of the nutrition epidemiology program at Tufts University. "But I have to in order to keep my research program going. There is no other option. I wish I could get all my research funds from NIH [the National Institutes of Health]. That's where the research money is." He says NIH funding is shrinking for epidemiologic studies, which are his focus. "I don't mean to diminish the problem of the potential for bias with industry funding, but the assumption that any work done by industry is biased is wrong," says Jacques, who suggests there's perhaps a more important bias associated with any study. "Maybe we [researchers] should all be declaring our prior beliefs in addition to who funded it." Gaine disagrees with the idea that present-day research funding influences recommendations for sugar intake. "Our message on sugar consumption is one of moderation. The work we do in science and in education is focused on understanding and educating on the appropriate, moderate role of sugar in the diet," she says. Gaine refers to US consensus reports that have determined that inadequate evidence exists to support the direct contribution of added sugars to obesity or heart disease. Specifically, although it's recognized that sugar-sweetened beverages increase adiposity (body fat) in children,11 she says neither the 2010 Dietary Guidelines for Americans (DGA)12 nor the Institute of Medicine macronutrient report13 concluded that added sugars consumption from all dietary sources in itself increases obesity. "I believe that the 2015–2020 recommendations, which include a concrete recommendation on added sugars, to limit consumption to less than 10% of daily calories are a major step in the right direction," Kearns says. "However, I believe this concrete limit should have been adopted by government agencies in the first USDA/HHS [Department of Health and Human Services] dietary guidelines issued in the '80s. I believe the [sugar] industry has worked to delay the adoption of a concrete limit on added sugars." On May 20, 2016, the FDA introduced the new Nutrition Facts label for packaged foods to reflect new scientific information, including the link between diet and chronic diseases such as obesity and heart disease. One of the items added to the label, which will begin appearing on food products in July 2018, is "Added Sugars," which will be displayed in grams and as %DV on the label. The FDA states that scientific data show that it's difficult to meet nutrient needs while staying within calorie limits if you consume more than 10% of your total daily calories from added sugars, which is consistent with the 2015–2020 DGA. Clearly, the debate will continue regarding how much the consumption of added sugars affects health, especially heart disease, and whether research funded by the sugar industry or any food company impacts the outcome. Even government agencies can't agree on the impact sugar has on health. In the meantime, the best advice to give to clients and patients is to aim for the 2015–2020 DGA, which recommend limiting intake of added sugars to less than 10% of total calories—a goal most in the United States haven't yet attained. Cochran's advice is to "Choose your sugars by the company they keep. Does the food containing sugar also provide other nutrients, like flavored yogurt or chocolate milk, or a breakfast cereal?" That, she says, should guide your food choices. 1. Kearns CE, Schmidt LA, Glantz SA. Sugar industry and coronary heart disease research: a historical analysis of internal industry documents. JAMA Intern Med. 2016;176(11):1680-1685. 2. Nestle M. Corporate funding of food and nutrition research: science or marketing? JAMA Intern Med. 2016;176(1):13-14. 3. Rippe JM, Angelopoulos TJ. Relationship between added sugars consumption and chronic disease risk factors: current understanding. Nutrients. 2016;8(11):E697. 4. What is the relationship between added sugars and risk of cardiovascular disease? (2015 DGAC). USDA Nutrition Evidence Library website. http://www.nel.gov/evidence.cfm?evidence_summary_id=250515. Published 2016. 5. Food labeling: revision of the nutrition and supplement facts labels. Regulations.gov website. https://www.regulations.gov/document?D=FDA-2012-N-1210-0875&source=govdelivery&utm_medium=email&utm_source=govdelivery. Published May 16, 2016. 6. Raatz SK, Johnson LK, Picklo MJ. Consumption of honey, sucrose, and high-fructose corn syrup produces similar metabolic effects in glucose-tolerant and -intolerant individuals. J Nutr. 2015;145(10):2265-2272. 7. Powell ES, Smith-Taillie LP, Popkin BM. Added sugars intake across the distribution of US children and adult consumers: 1977-2012. J Acad Nutr Diet. 2016;116(10):1543-1550. 8. Myers EF. Nutrition research integrity: to believe or not to believe? That is the question! Nutr Today. 2016;51(5):251-258. 9. Chartres N, Fabbri A, Bero LA. Association of industry sponsorship with outcomes of nutrition studies: a systematic review and meta-analysis. JAMA Intern Med. 2016;176(12):1769-1777. 10. Massougbodji J, Le Bodo Y, Fratu R, De Wals P. Reviews examining sugar-sweetened beverages and body weight: correlates of their quality and conclusions. Am J Clin Nutr. 2014;99(5):1096-1104. 11. Is intake of sugar-sweetened beverages associated with adiposity in children? USDA Nutrition Evidence Library website. http://www.nel.gov/evidence.cfm?evidence_summary_id=250363xx. Published 2016. 12. US Department of Health and Human Services. Dietary Guidelines for Americans 2015–2020: Eighth Edition. Published January 7, 2016. 13. Institute of Medicine Food and Nutrition Board. Dietary Reference Intakes for Energy, Carbohydrate, Fiber, Fat, Fatty Acids, Cholesterol, Protein, and Amino Acids. Washington, DC: The National Academies Press; 2005. 14. US Department of Agriculture; US Department of Health and Human Services. Scientific Report of the 2015 Dietary Guidelines Advisory Committee 2015. http://www.health.gov/dietaryguidelines/2015-scientific-report. Published February 2015. 15. Added sugars. American Heart Association website. http://www.heart.org/HEARTORG/HealthyLiving/HealthyEating/Nutrition/Added-Sugars_UCM_305858_Article.jsp#.WDMo3KuEdqc. Updated July 20, 2016. LabelingNutrition/ucm385663.htm. Updated November 22, 2016. 17. Erickson J, Slavin J. Are restrictive guidelines for added sugars science based? Nutr J. 2015;14:124.